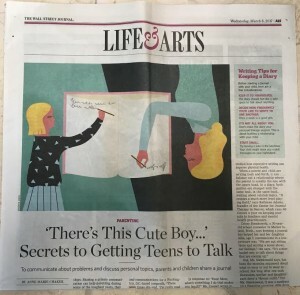 Wednesday’s Wall Street Journal had an excellent article in the Life & Arts section, “‘There’s This Cute Boy…’ Secrets to Getting Teens to Talk,” by Anne Marie Chaker. The article is about kids and their parents writing journals to each other, sometimes instead of talking, but hopefully to break the ice for difficult conversations. The article reminded me of something I’ve blogged about before—the many letters I wrote to my grandmother during my childhood (in the 1950s) and into my teenage years and even the early years of my marriage. I felt “safe” telling my grandmother things I might not tell my mother—including how I felt when my mother and brother yelled at each other (which happened a lot, and I would go to my room and turn up the radio to block it out) but also poignant moments like my first kiss. I have a shoebox full of those letters, which are a treasure. So sometime last year I started writing to my granddaughters who live in Denver, and receiving precious letters back from them, especially the older two, who are 6 and 7. Recent letters from these two were especially touching. Grace (7) told me she is studying Black history in second grade. She said her teacher told them that there was slavery in Mississippi, and since I’m from Mississippi, she asked whether I knew any slaves when I was a little girl. I responded by explaining that I lived many years after the slaves were freed, but that unfortunately many Black people were still being treated unfairly when I was a little girl (and even now), and how important it is for us not to judge people by the color of their skin, the shape of their eyes (this granddaughter is Asian), or which country they are from. Anna (6) wrote a letter to Pops (my husband) asking him two questions: (1) What is your favorite color? And (2) What is your favorite animal? He answered her back: BLUE, and LION. Now, I’ve been married to this man for almost 47 years, and it never occurred to me to ask him either of these questions, so we had a revealing moment and discussion. Turns out he loves lions not only because they are majestic and beautiful, but because of the lion, “Aslan,” who represents Christ in the Narnia Chronicles. 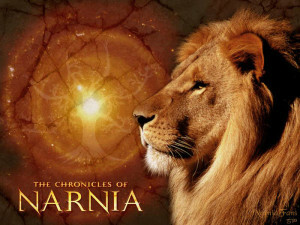 He has asked me to bring some of the Narnia books with us to the beach next month so he can read them to his granddaughters. Today I know that “Face Time” (which we enjoy with all 4 granddaughters) has probably replaced hand written letters as the primary means of communication between the generations, but I plan to keep up the letter writing as long as my granddaughters will participate. There’s something really special about it. I feel a different kind of closeness in this exchange, and I hope they will keep responding to my letters! We are expecting our first grandchild later this year. S/he is likely to be raised in the UK. I hope that we can follow your lead and exchange some written communication over the years, as well as using digital means on a regular basis, as you are doing.